BEIJING (AP) — Air quality reached extremely hazardous levels in the northeastern Chinese city of Shenyang, as northern China began to burn coal to heat homes for winter. 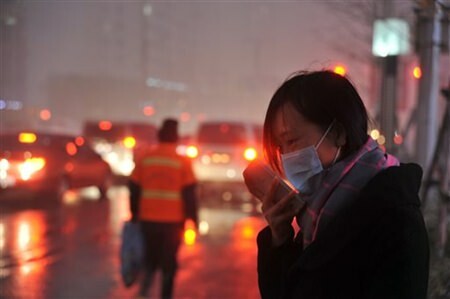 Real-time data released by the Shenyang Environmental Protection Agency Sunday showed the density of the poisonous tiny airborne matters known as PM2.5 was more than 1,000 micrograms per cubic meter. Nearby cities also reported very high levels of the harmful particulates. The World Health Organization considers the safe level of PM 2.5 to be 25 micrograms per cubic meter on a 24-hour average basis. The readings from Shenyang are possibly the highest pollution levels ever recorded in China since the country began to monitor air quality and release real-time data in 2013. Local authorities said the density of PM 2.5 — considered extremely harmful to human health — peaked Sunday afternoon at more than 1,200 micrograms per cubic meter. The official Xinhua News Agency reported that the reading had reached as high as 1,400 micrograms per cubic meter at some monitoring sites. Local authorities issued the highest alert, warning residents to stay indoors and demanding that factories cut output to reduce pollution. Photos posted on social media showed gray skies, and members of the public complained of sore throats. Northern China typically burns coal to heat homes in the winter, a practice believed to have fouled the air. Emissions from industrial plants and the increasing use of cars also are major causes of air pollution in China.